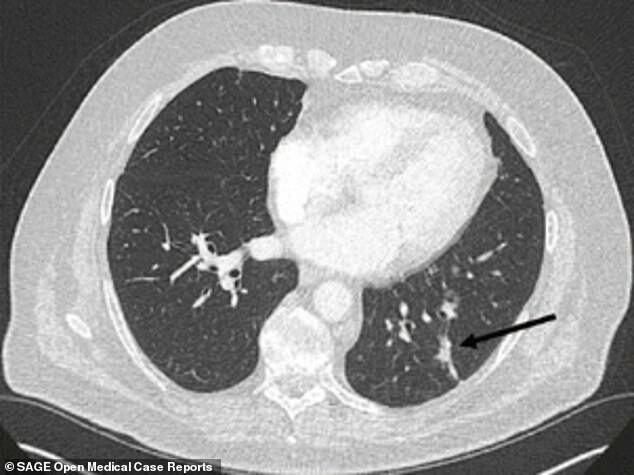 An 81-year-old man, who has not yet been identified, managed to shrink his tumors in half after being diagnosed with lung cancer and refusing traditional cancer treatment such as chemotherapy and radiation. 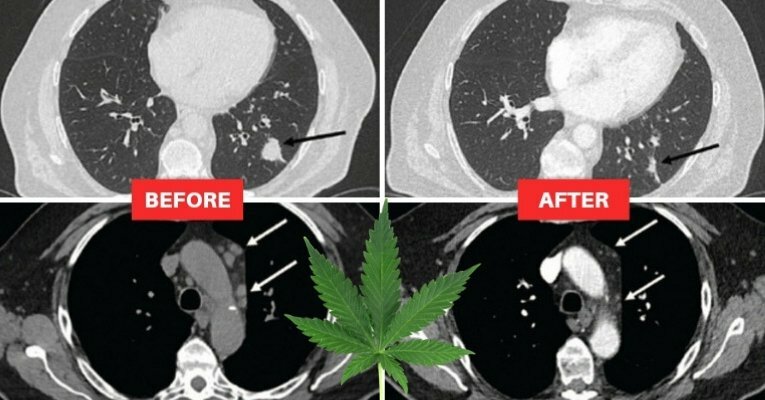 The man, who previously smoked around 18 cigarettes per day but quit 45 years ago, repeatedly refused medical treatments offered by doctors after being diagnosed with adenocarcinoma of the lung, opted to take cannabidiol (CBD) oil instead. 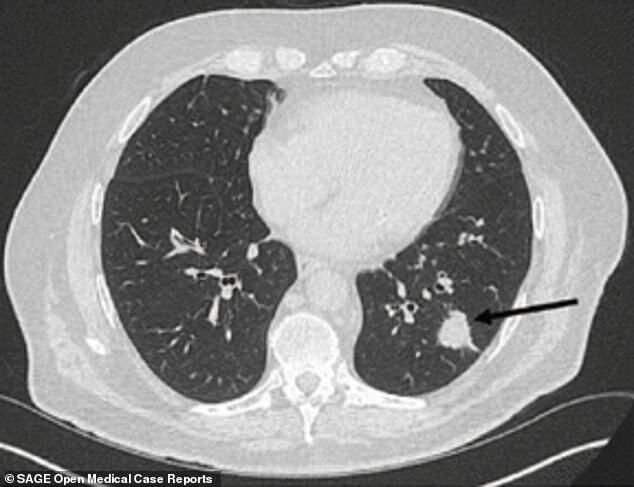 After three months of almost daily use, scans of the man’s lungs showed that, not only did the tumors reduce in size by half, but the progression of the disease was completely reversed. The man’s doctors have published the stunning scans and detailed his case in SAGE. In October 2016, the man, who had previously been diagnosed with chronic obstructive pulmonary disease (COPD), diabetes, and prostate cancer (in remission), made an appointment with his primary care doctor after dealing with shortness of breath but no cough for the previous three weeks. An x-ray revealed a shadow in his left lung, which a follow-up CT scan confirmed as a 2.5 × 2.5 cm mass. A biopsy confirmed the diagnosis of lung adenocarcinoma and mediastinal lymph nodes. CT scan of the man’s lungs from July 2017. The arrow indicates the location of the tumor. CT scan of the man’s lungs from November 2017. The arrow indicates the location of the tumor, which reduced in size since the previous scan. The report highlights the fact that, despite the improvement of targeted therapy in lieu of conventional therapy for lung cancer as well as the availability of new drugs, “lung cancer is associated with a very poor prognosis.” Because “it is not uncommon for many patients to have only a partial response, and relapse during follow-up,” it is not unusual for some patients to decline medical treatment altogether or opt for a natural alternative instead, especially later in life when available treatments tend to have a more detrimental effect on the body. The man reported that he began taking CBD oil (200 mg CBD in 10 mL) in September of 2017. He began with two drops twice daily for a week before increasing to nine drops twice daily for the rest of the month. After a November CT scan, he increased his dose to nine drops twice a day, save for a short break in which he felt the taste caused slight nausea, but never actually made him physically ill.
During the period of the time in which the tumor’s shrunk, there were no notable changes in the man’s diet, lifestyle, or medication. CBD oil is a non-psychoactive phytocannabinoid found in cannabis plants (or Cannabis sativa). It has been shown to aid users in treating anxiety, arthritis, pain, depression, and more and is being used with increasingly frequency to relieve pain associated with cancer and cancer treatment and in an attempt to treat the cancer itself. It was reported last year that an 83-year-old man named Gary Hill, who was also diagnosed with lung cancer, was also able to successfully shrink his tumor by using CBD oil. Reports citing anecdotal evidence continually surface detailing how cancer patients using cannabidiol were able to shrink or completely cure their cancers including skin, breast, and liver cancers. In extreme cases, some patients have even halted conventional treatment due to a significant risk that they may not even survive it, only to later cure their cancer using CBD oil. Such a case, involving a three-year-old girl, was reported by People magazine in 2018.